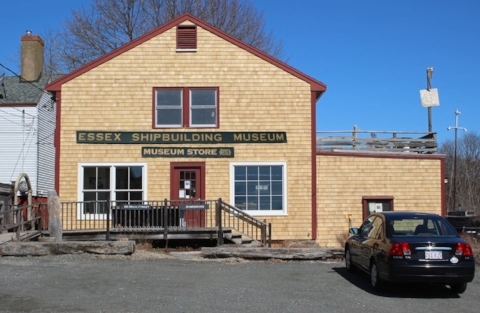 The Essex Historical Society and Shipbuilding Museum provides a center for education, preservation, and study of traditional wooden shipbuilding and the community that supported it for more than 350 years. The Essex Historical Society and Shipbuilding Museum has permanent and rotating exhibits in our Orientation Center, set in the historic A.D. Story Shipyard at 66 Main Street, and at our school house at 28 Main St. All tours begin in the Orientation Center. This former Story residence contains a diorama of the Story shipyard, admissions, video theater, gift shop, and Museum offices. In 1993, The society purchased a section of riverfront where shipbuilding flourished for over 300 years. This historic site is where the Story family operated its shipyards from 1813 to the end of World War II. The yard is still active and showcases machines, tools, materials and boats. This is the education hub for visiting school and bus groups. Equipped with historical artifacts, tools, displays, and machinery exhibits, this large, multi-function room is also used for meetings, lectures, and concerts. Built in the shipyard in 1927 and used until the 1980s for swordfishing and later as a fishing dragger, the museum acquired the Evelina M. Goulart in 1990. She is one of only seven historic Essex-built schooners that survive. Her construction and history tell a symbolic story of the shipbuilding industry. The 1835 Schoolhouse contains semi-permanent exhibits and ship models as well as our archives. It is open for guided tours, education groups, and bus tours. The building was used as a two-room school house until it was turned over to the Grand Army of the Republic in 1890, followed by the American Legion in 1919. In 1976, it became the first home of the Essex Historical Society and Shipbuilding Museum. Adjacent to the schoolhouse is the town's first burial ground, with stones ranging in date from 1708 to 1888 which provide an excellent overview of early New England gravestone styles and are useful in comparing gravestone art in Essex (which until 1819 was the Chebacco Parish of Ipswich) to patterns found in other early New England towns. It is also a valuable genealogical resource and the Museum maintains an inventory detailing the names and epitaphs on all gravestones. More than 2,000 persons are buried there including veterans of the French and Indian Wars, the Revolutionary War, the War of 1812 and the Civil War. The first schoolmaster rests there along with many of the town’s shipbuilders and the first three pastors of the village church. The first pastor, Rev. John Wise, is buried in the center of the yard under the table-like stone. He was a widely read author who protested taxation without representation as early as 1687. When copies of his essays were reprinted and distributed throughout the colonies in 1772, his words set the tone for the American Revolution. Gravestone art shows examples of typical 18th and 19th century styles. The Hearse House was built around 1840 and is one of only two known remaining in New England and contains original Victorian hearses: a sleigh hearse that was used during the winter months and a dome hearse that was purchased secondhand by the town on December 14, 1861, from a Mr. Lock of Braintree, MA. There are also two holding boxes that predate the practice of embalming and used block ice to preserve the body of the deceased. Window-glass permitted viewing of the face from the front and in profile. Open for guided and self guided tours on Saturdays and Sundays, 10am to 5pm. Tours available Monday to Friday by appointment. Contact Chris at (978) 768-7541 or chris@essexshipbuilding.org. Self Guided Tours - $7 per person, general admission. Guided Tours at 10:30am, 1:00pm, and 3:00pm - $10 per person, senior and child rates available. Group tours and field trips can be scheduled weekdays. For rates and information please visit out Group Tour page.